Cass Seltzer has the world on a string. The “atheist with a soul”, he’s become something of a media darling after publishing an accessible best-selling book about the psychology of religion called The Varieties of Religious Illusion. He’s won over a beautiful, brilliant mathematician, Lucinda Mandelbaum, author of the groundbreaking Mandelbaum Equilibrium, goddess of game theory, recent victim of academic infighting. He is set to debate the existence and necessity of God on a national stage with a famous conservative intellectual, Felix Fidley. Everything is going right. But Cass’s past is haunted. His old mentor, the expansive eccentric Jonas Elijah Klapper, still casts a shadow over him. So too does the memory of Azarya, the mathematical genius son of a Hasidic rabbi, to whose sect Cass has family ties. At the dawn of his future, Cass has to face his past. 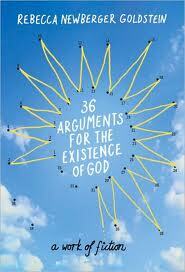 36 Arguments for the Existence of God, by novelist and philosopher Rebecca Newberger Goldstein, is a multifaceted, stimulating book, full of life and humor. It’s a satire of both academic infighting and of the limbo state of graduate school. It backs away from being a love story, but it has a lot to say about the joyous irrational folly of falling in love. It’s an atheist novel and at the same time inescapably a Jewish novel, written as it is by the winner of a major Jewish literary award for her biography Betraying Spinoza. (Spinoza, unmistakably and perhaps unavoidably, is all over this book.) And it’s a novel about squaring your roots with your branches, as we see Azarya mature from spooky genius child to conflicted young man and on into adulthood. As much as this is Cass’s story, it’s Azarya who steals the show; he is no mere caricature of a child prodigy but a believable and heartbreaking character who must, ultimately, decide whether to use his gifts for himself or to set them aside and become, as his father’s only son, the rabbi of the insular Valdener community. Boy, you never knew what kind of Krap the Klap was going to throw at you. Roz almost had to admire him. It is this learned lunatic who inspired Cass, and ultimately whom he must betray, siding with what Klapper calls “scientism” rather than follow his mentor on his endless and fruitless quest for the Divine. The final straw – in the form of a crazed, wounded op-ed that appears in the newspaper the morning of the debate – is both hilarious and painful, and one of the best moments of the book. It is not a book for everyone. In this religion-mad era, a book such as this is bound to be seen by many as more of a challenge than an invitation to contemplation. In a time where the so-called New Atheists are portrayed as no better and no healthier for the world than their fundamentalist opposite numbers, an overtly atheistic book is bound to be poorly received in some quarters. (One review I saw called the appendix, which does in fact fairly state and refute thirty-six arguments for the existence of God, “annoying” and “unhelpful” to the larger discussion, implying that it’s all right to be an atheist as long as you don’t explain why.) At the novel’s climax, the debate with Felix Fidley comes off as fair and never crosses what I’ll call the Ayn Line, on the wrong side of which a novel becomes polemic. On the whole, Goldstein succeeds in both entertaining and enlightening, and in an age where few enough novels accomplish either of those things, this one stands apart. “…squaring your roots…” Great stuff, Mark. And I love the “Ayn Line” line, since I almost skipped the middle thousand pages of “Atlas Shrugged” where she explains/defends her entire philosophy through John Galt’s speech. Damn, just write a separate book about it, or start an Institute or something. Great review, gives the elements of the story without spoilers, and yet enough details to make me want to read this book. Another home run, Mark! You have a knack for making these reviews pop.